As Lehi and his family traveled through the wilderness, they would name places where they stopped. Lehi “called the name of the river, Laman” (1 Nephi 2:8), which ran through “the valley which he called Lemuel” (1 Nephi 16:6). At another camp, Nephi remembers, “we did call the name of the place Shazer” (1 Nephi 16:13). When they arrived at a coastal location with an abundance of fruit and honey, Nephi says it’s “the land which we called Bountiful” and the sea, he says, “we called Irreantum” (1 Nephi 17:5). When Ishmael died, however, Nephi uses the passive voice to identify “the place which was called Nahom” (1 Nephi 16:34). “Note,” Hugh Nibley stressed as early as 1950, “that this is not ‘a place which we called Nahom,’ but the place which was so called.”1 Unlike the other campsites named in the text, this one already had a name, which Lehi’s group could, logically, only have learned by talking with local people. The inscriptions found at Mārib and elsewhere add assurance that the Nihm region was known by that name when Lehi’s family would have been there to bury Ishmael and mourn his death, and the overall correlation between Nihm and Nahom is striking. Although the Nihmite altars, discovered in the late 1990s, do not say, in effect, “Lehi slept here” or “Ishmael was buried here,” this historical data is significant and should not go unnoticed by anyone tracking the trail that Lehi and his party followed down the western coast of the Red Sea. Writing in 2002, Terryl Givens, a Latter-day Saint historian and professor at Richmond University, marveled, “Found in the very area where Nephi’s record locates Nahom, these altars may thus be said to constitute the first actual archaeological evidence for the historicity of the Book of Mormon.”16 Since the finding of these altars, it cannot honestly be maintained that there is no archaeological evidence for the Book of Mormon. Neal Rappleye and Stephen O. Smoot. “Book of Mormon Minimalists and the NHM Inscriptions: A Response to Dan Vogel.” Interpreter: A Journal of Mormon Scripture 8 (2014): 157–185. Warren P. Aston, “A History of NaHoM,” BYU Studies Quarterly 51, no. 2 (2012): 79–98. James Gee, “The Nahom Maps,” Journal of Book of Mormon and Restoration Scripture 17, no. 1–2 (2008): 40–57. S. Kent Brown, “New Light from Arabia on Lehi’s Trail,” in Echoes and Evidences of the Book of Mormon, edited by Donald W. Parry, Daniel C. Peterson, and John W. Welch (Provo, Utah: Foundation for Ancient Research and Mormon Studies, 2002), 81–83. Warren P. Aston and Michaela Knoth Aston. In the Footsteps of Lehi: New Evidence of Lehi’s Journey across Arabia to Bountiful (Salt Lake City, Utah: Deseret Book, 1994), 3–25. 1. Hugh Nibley, Lehi in the Desert/The World of the Jaredites/There Were Jaredites, The Collected Works of Hugh Nibley: Volume 5 (Salt Lake City and Provo, Utah: Deseret Book and FARMS, 1988), 79, italics of we added. 2. Ross T. Christensen, “The Place Called Nahom,” Ensign (August 1978): 73. For the Hilton’s work, see Lynn M. Hilton and Hope A. Hilton, “In Search of Lehi’s Trail—Part 1: The Preparation,” Ensign (September 1976): 32–54; Lynn M. Hilton and Hope Hilton, “In Search of Lehi’s Trail—Part 2: The Journey,” Ensign (October 1976): 34–63. 3. Warren P. Aston and Michaela Knoth Aston, In the Footsteps of Lehi: New Evidence of Lehi’s Journey across Arabia to Bountiful (Salt Lake City, Utah: Deseret Book, 1994), 14–16. 4. S. Kent Brown, “New Light—‘The Place That Was Called Nahom’: New Light from Ancient Yemen,” Journal of Book of Mormon Studies 8, no. 1 (1999): 68. 5. St. John Simpson, ed., Queen of Sheba: Treasures from Ancient Yemen (London: British Museum Press, 2002), 166. Some critics have insisted that Nihm was a tribal name, but not a toponym or place name. The tribal territory, however, bears the Nihm name today, and has borne it for as far back as we can trace any Arabian place names. In common with other tribal territories in southern Arabia, Nihm is the name of the tribe and of its territory. 6. Not understanding Semitic languages, some critics have made a big deal out of the different vowels, or other spelling/pronunciation differences. For a response see Neal Rappleye and Stephen Smoot, “Book of Mormon Minimalists and the NHM Inscriptions: A Response to Dan Vogel,” Interpreter: A Journal of Mormon Scripture 8 (2014): 173–179. 7. 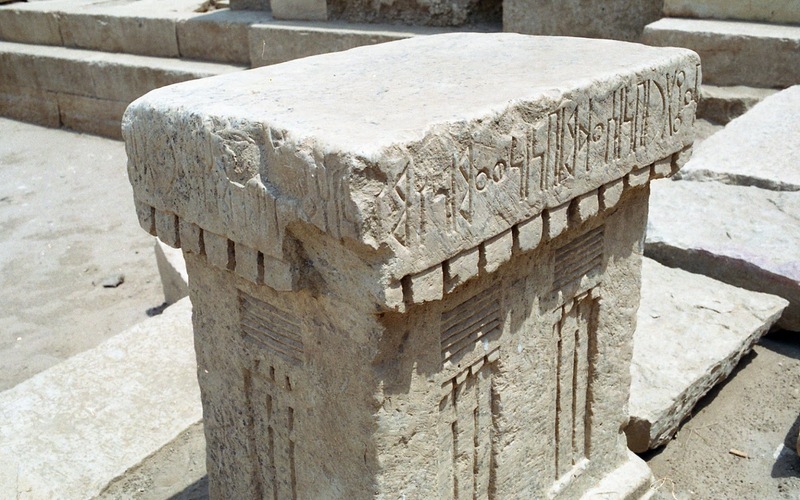 Warren P. Aston, “Newly Found Altars from Nahom,” Journal of Book of Mormon Studies 10, no. 2 (2001): 57–61. 8. Burkhard Vogt, “Les temples de Maʾrib,” in Yémen: au pays de la reine de Saba (Paris: Flammarion, 1997), 144. Translation by Gregory L. Smith. 9. Warren P. Aston, “A History of NaHoM,” BYU Studies Quarterly 51, no. 2 (2012): 87. 10. Aston, “A History of NaHoM,” 90–93. 12. Aston and Aston, In the Footsteps of Lehi, 19. 13. Aston, “The Origins of the Nihm Tribe,” 147. 14. Warren P. Aston, “The Arabian Bountiful Discovered? Evidence for Nephi’s Bountiful,” Journal of Book of Mormon Studies 7, no. 1 (1998): 4–11. 15. S. Kent Brown, “New Light—Nahom and the ‘Eastward’ Turn,” Journal of Book of Mormon Studies 12, no. 1 (2003): 111–112; Aston, “A History of NaHoM,” 84. 16. Terryl L. Givens, By the Hand of Mormon: The American Scripture that Launched a New World Religion (New York: Oxford University Press, 2002), 120.